Khirbet Qeiyafa. Image Source: Times of Israel. Did the ancient land of Israel exist? Archaeologists have debated this question for decades. Of course, their findings have political implications in today's Middle East and their debates may well be influenced by those implications. Now, a dig at the ancient city of Khirbet Qeiyafa is providing a 3,000 year old history lesson on the past - and the present. On 8 May 2012, archaeological finds 15 miles southwest of Jerusalem seemingly confirmed the existence of the biblical figures King David and King Solomon. 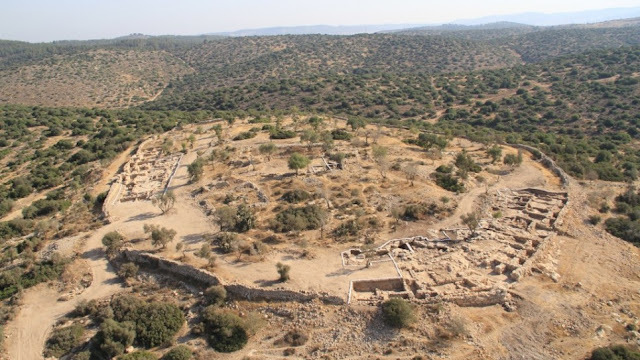 The confirmation rests on excavations at Khirbet Qeiyafa (which may have been the biblical city of Sha'arayim or Neta'im), dating back to the 10th century BCE. For the first time, archaeologists have uncovered shrines from the time of the early Biblical kings in the Holy Land, providing the earliest evidence of a cult, they say. ... Excavation[s] ... have revealed three large rooms used as shrines, along with artifacts, including tools, pottery and objects, such as alters associated with worship. [Lead archaeologist Yosef] Garfinkel suggests some of the features and styles of the structures appear analogous to those described in the Bible. For instance, one of the shrines, the clay one, is decorated with ...two pillars ... . The two pillars are suggestive, he said, of Yachin and Boaz described in the Bible as belonging to Solomon's Temple. The Temple's two pillars - which Garfinkel associates with the portable shrines - represented the Pillars of Creation, the Trees of Eden. Also consistent with biblical accounts, according to Garfinkel, is the lack at Khirbet Qeiyafa of cultic figurines of animals and people, and the absence of pig bones at the site, indicating a religious dietary law against the consumption of pork. 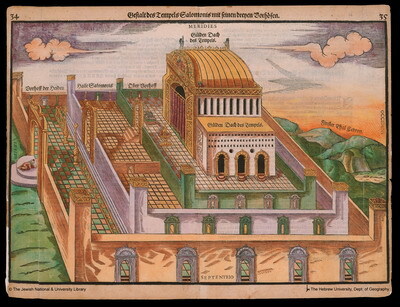 Depiction of Solomon's legendary Temple in Jerusalem. Image Source: King Solomon Legend. 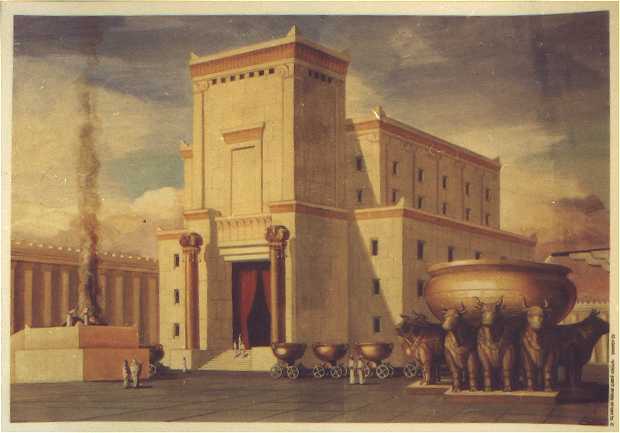 Another imagining of the Temple of Solomon. Image Source: Imagebearer's Weblog. 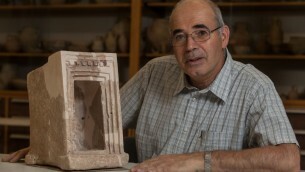 "Yosef Garfinkel with a shrine model made of stone, found at Hirbet Qeiyafa." Image Source: Hebrew University of Jerusalem via Times of Israel. In 2008, Yosef Garfinkel, a professor of archaeology at the Hebrew University of Jerusalem, unearthed a potsherd at the site, known as Khirbet Qeiyafa, inscribed with ancient Hebrew characters and dated to the 10th century BC—the earliest Hebrew inscription yet discovered. He also found a highly unusual second gate in the heavily fortified city walls. The combination led him to identify the location as Shaarayim (Two Gates), a city mentioned three times in the Bible, most notably as the town to which the Israelites chased the Philistines after the slaying of Goliath (I Samuel 17). In early May, Garfinkel announced his most recent discovery: three large shrines, standing stones, altars, and other cultic objects, including two portable model shrines made of pottery and stone. Garfinkel said his discoveries proved that those who "completely deny the biblical tradition regarding King David and argue that he was a mythological figure, or just a leader of a small tribe, are now shown to be wrong." Garfinkel's finds have triggered a wave of excitement from one set of scholars—and a chorus of derision from another. In a scathing essay published just before the latest finds were announced, Israel Finkelstein, a professor of archaeology at Tel Aviv University, dismissed Garfinkel's dating of the site as a product of "methodological shortcomings in both fieldwork and interpretation of the finds." For the past 20 years, archaeologists have been locked in a battle over the very existence of David and his son Solomon, the extent of their influence, and when they reigned, if at all. Though the events under discussion occurred some 3,000 years ago, the debate has stirred strong emotions fueled by modern-day politics, academic rivalry, and a very 21st-century recruitment of modern media techniques that have divided the dry and dusty world of archaeological research into warring digital camps. The David debate first spiked in the 1990s, when Finkelstein challenged the traditional idea of "a great United Monarchy of Israel, established in the course of the military exploits of King David and stabilized in the days of his son Solomon, who ruled over a glamorous, rich, and prosperous state." That notion had emerged from excavations conducted by the founder of biblical archaeology, William F. Albright, in the 1930s, and subsequently was cemented in popular perception in the 1970s by the archaeologist Yigael Yadin's discoveries at Megiddo, 75 miles north of Jerusalem. The traditional view, Finkelstein argued, was based mainly on the biblical account of Israel's early history. "In other words, this is a unique (and annoying) case in which archaeologists compromised the evidence provided by their own discipline in favor of the one-sided interpretation of the textual material provided by another discipline." The archaeologists to whom he referred are sometimes known as Maximalists, and they are concentrated at the Hebrew University. Supporters of the "High Chronology," they believe that by the 10th century BC, the House of David ruled, first from Hebron and then from Jerusalem, over a polity extending as far as the Elah Valley in the west and Hebron to the south—a day's march in either direction. Some believe it reached all the way to Megiddo, where Yadin unearthed monumental ruins ascribed to the ancient kingdoms, including an area previously identified as "Solomon's Stables" that he reattributed to King Ahab—just as unscientifically, according to Finkelstein. But "not one of the arguments of the traditional chronology can withstand a thorough scrutiny, free of theological or simply romantic bias," wrote Finkelstein. "The biblical David almost certainly didn't exist," says Philip Davies, emeritus professor of biblical studies at the University of Sheffield, in England, whose book In Search of 'Ancient Israel' questioned the entire notion of an ancient Jewish kingdom. "There probably never was such a thing as 'the Land of Israel,'" he says. Rabbis were probably the first to use the Hebrew term eretz yisrael to mean "Palestine." Certainly, he says, eretz yisrael is never used in connection with the promise of land by God or the conquest of land. He charges the Maximalists with interpreting the Bible through the distorting lens of modern politics to provide an ideological underpinning for modern Zionism and the State of Israel. "The existence of Abraham and Moses has been in serious doubt amongst biblical scholars for many decades. David is now coming into the limelight," says Davies. Garfinkel's latest finds from Khirbet Qeiyafa may win the argument—unless the rival camp can provide an alternative explanation for the newly unearthed cultic objects. He says his reference to King David has no connection to the modern state of Israel or Zionist ideology. The 10th-century date has been confirmed by carbon-14 tests. He says the absence of pig bones, the lack of human or animal forms in the religious vessels, and the Hebraic inscription set Khirbet Qeiyafa apart from nearby Canaanite or Philistine sites of the same period. "Here we are in the Elah Valley. According to the radiocarbon dating we are in the time of David, and we have two gates, so we match very nicely the biblical description of Shaarayim," says Garfinkel. "The Minimalists can't bear this because it destroys the idea that the Bible has no historical memories from the 10th century. But this site shows you that some historical memories are embedded in the biblical tradition."